AndBeyond’s mobile, semi-permanent safari camps offer the unique opportunity to be in the right place at the right time to see the Great Migration. The locations of these migratory camps are carefully plotted to coincide with the documented movements of the annual Great Migration as it traverses the Serengeti plains. Having secured some of the Serengeti's best semi-permanent campsites, these camps bring guests as close as possible to the migration or resident game. The campsites are all prebooked for the safari's use, allowing tremendous flexibility in moving the camps according to the expected migration movements. The massive herds move relatively slowly, enabling the camps to plan ahead and set up in the best possible locations. The aim is to position the camps within comfortable driving distance of the migration during exciting daily safaris (early in the morning and again during the afternoon and early evening), or often for the full day. However, with nature being as unpredictable as it is, close proximity to the mass herds cannot always be guaranteed. When the migration crosses over into Kenya, the camps are located in the remote and beautiful corners of the Serengeti, which are renowned for their excellent resident game. Guests are hosted by experienced AndBeyond safari guides. Using only private campsites, these migratory camps are entirely intimate and exclusive. This is the ultimate in luxury fly camping. This is the soul of Africa - no mains electricity and no running water. The simplicity of camping, blending with the relaxing solitude of the Serengeti, makes this safari unforgettable. Serengeti Under Canvas camps boast the same style, comfort and sheer elegance that guests have come to expect as the AndBeyond norm. This is Serengeti in style - a chance to partake in a classic Tanzanian safari as it would have been experienced in the 1920's. Roaming wilderness camps will follow in the footsteps of the animals, featuring bedouin style tents with full ensuite facilities, outdoor bucket showers and separate w.c.'s. The luxury semi-permanent tented camps proudly feature some of Tanzania's largest and most spacious mobile tents, each with double bed, en suite bathroom, separate w.c., and romantic al fresco bucket shower (hot water delivered upon request). With a hint of Bedouin character, these tents boast custom-made Indian rugs, crisp linens, sparkling crystal, and polished brass samovars and basins. Each camp has its own expert AndBeyond guides, as well as two fully-equipped safari vehicles complete with onboard safe and charge points for digital cameras and equipment. This is the soul of Africa - no mains electricity and no running water. The simplicity of luxury camping and the relaxing solitude of the mighty Serengeti offers guests a safari of the soul.  Serengeti camps – 6 luxury roaming en suite tents complete with hot bucket showers.  Location: exclusive camping in predetermined private campsites in the Serengeti National Park.  Camp description: 3 six-tented rigs (Jan-May) 2 six-tented rigs (Jun-Dec).  Safaris: full-day (or twice-daily) game drives in the Serengeti (picnic lunch provided if out all day) with expert AndBeyond trained guide (no tracker).  Vehicles: semi-open safari vehicles (4 to 6 guests per vehicle).  Klein’s wilderness camp – 6 opulent en suite tents with personalised butler service.  Location: camping on AndBeyond's private Klein's Camp concession bordering the Serengeti National Park.  Safaris: twice-daily game drives with tracker (including night drives and off-road safaris) and interpretive walks with expert AndBeyond trained and armed guide and Maasai tracker.  Vehicles: semi-open safari vehicles (6 guests per vehicle). All AndBeyond lodges are world-renowned for their delicious Pan-African cuisine – fresh ingredients, simply prepared with an African flavour. All halaal and vegetarian dietary requirements will be catered for. When making your reservation, please advise us of any specific dietary requirements that you may have, and these will be communicated immediately to the camp. Should specific items need to be flown in, there will be an additional charge, which will be quoted separately. Regrettably, we are unable to cater for strictly kosher guests. Children 12 years and older are welcome, however, Serengeti Under Canvas is regrettably not suitable for children younger than 12 years. Children under 12 years may be accommodated if sole use of camp is booked. Expert AndBeyond rangers and guides will lead you on game-drives in open 4x4 safari vehicles through the Serengeti or Klein's private wildlife concession. Action-packed night game-drives are unique to Tanzania, offering guests extraordinary game viewing. Experience interpretive bush walks, visits to local Maasai manyattas (homesteads), safaris to Lobo Hills and Seronera in central Serengeti, and exciting bush banquets. Serengeti Under Canvas operates year round, even during April and May. An ideal time to experience Tanzania's wilderness, when the vast green plains are lush and plentiful, with dramatic afternoon thundershowers. Witness the unforgettable sights as the lightning flashes and the rainbows soar high above the Serengeti plains. Only using private campsites, these migratory camps are intimate and exclusive. The camp traverses the rocky slopes of the Kuka Hills, including open woodland savanna, dominated by acacia and desert date trees. Grassland savanna comprises tall grass with scattered trees, and an evergreen riparian forest fringes the Grumeti River. Commiphora, ficus, rhus and cordia are among the trees found on the rocky hillsides. Bush-clump thickets of grewia, gardenia and cordia shrubs are hiding places for smaller mammals and feeding sites for birds. Individually recognisable leopard and cheetah are regularly located in their known territories. Tens of thousands of zebra and wildebeest pass through the Klein's valley on their annual migration to and from Kenya's Masai Mara. Huge herds of buffalo and breeding herds of elephant offer exceptional game viewing. Bohor reedbuck and Defassa waterbuck favour marshland fringes. Chandler's reedbuck and rock hyrax inhabit the rocky slopes above the camp. Silver galago (of the black melanistic form) favour taller riverine trees. 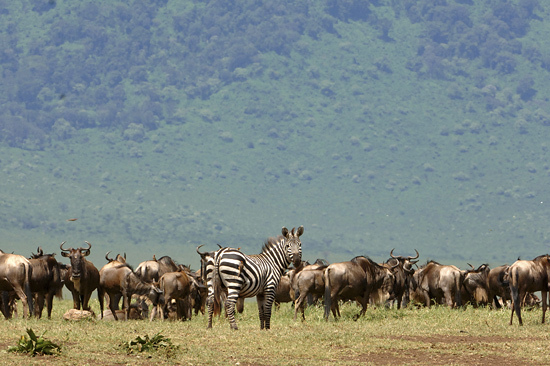 Resident herbivores are joined each season by huge numbers of migratory wildebeest and zebra. Bat-eared fox and serval are among regularly seen smaller carnivores. There are 345 species recorded for Serengeti Under Canvas. Pygmy falcon, pearl-spotted owlet, slate-coloured boubou and spot-flanked barbet are common in woodland and bush-clumps. Grey crowned crane, wattled lapwing and malachite kingfisher are among species attracted to marshlands. African green pigeon, Schalow's turaco, Narina trogon and white-headed barbet are among fruit-eaters in riparian forest. Large flocks of gregarious yellow-throated sandgrouse visit waterholes to quench their thirst. Dazzling Fischer's lovebirds feed alongside grey-capped social weavers and blue-capped cordonbleu in bush clump thickets. Tawny eagle, bateleur and white-headed vultures are among breeding raptors. Vast numbers of migratory storks, kestrels, harriers and other birds from September to March. Large leopard tortoises inhabit rocky areas where African rock python also find refuge. Aquatic terrapins live in marshlands and streams. Brightly-coloured, flat-headed mwanza agama bask on rocks around the camp. A rich variety of butterflies, moths, dragonflies and other insects are to be seen. Massive Nile crocodiles inhabit the waters of the Grumeti River. Colonies of pugnacious cocktail ants live in whistling thorn trees. Serengeti Under Canvas is committed to AndBeyond’s core principle: Care of the land, Care of the Wildlife, Care of the People. AndBeyond’s focus: Community equity, income generation, education and health care are a primary concern. In consultation with community organisations such as the Africa Foundation – originally founded by AndBeyond, now a not-for-profit rural development organisation – AndBeyond has contributed significantly towards improving the prosperity and living conditions of rural communities. Ecotourism in Africa: Our guests play a critical role in helping AndBeyond realise our dream and vision: to create a model in wise land management, integrating international travellers and rural people to their mutual benefit and demonstrating that wildlife can be preserved on a sustainable basis by all. AndBeyond strongly believes in its people and was recently listed as one of three finalists in the Investor in People category of the 2005 Tourism for Tomorrow Awards. The October 2005 edition of Africa Geographic featured an article on AIDS and conversation, and highlighted the activities and programmes that various African companies are implementing in order to increase AIDS awareness and, in doing so, empower the communities taking care of some of the world's richest wilderness regions. "Probably the most attractive program ... is that of AndBeyond... AndBeyond launched a Positive Health program in 2003 and in April and May last year ran two seven-day courses.... Their approach focuses on home-based care, gardens, counseling techniques and gender issues.... The health of the habitat is critical to the health of the individuals in it.... The conservation industry is uniquely positioned to take the treatment of HIV/AIDS in radically new directions.... Benefits [of the program] include acquiring 'hard skills' such as maintaining clean water, producing food, and home-based methods of dealing with illnesses that are not life threatening.... It takes only the will of ecologically minded people to make sure that the wild places are not lost."  Weather: Warm to hot climate year round due to proximity to the equator; cool evenings.  Temperature: A warm climate with maximum temperatures of 32°C/90°F. Early mornings and evenings can be cold with minimum temperatures of 12°C/90°F. Winter is from May to September, and summer from October to April.  Best time to travel: In addition to the annual Great Migration, Serengeti Under Canvas offers excellent game viewing opportunities throughout the year. The Migration is a 12-month cycle and usually passes through Klein’s during the ‘short’ rains in November and December on their way to their breeding grounds in the Serengeti. Just after the ‘long rains’ from March to May, wildebeest arrive in their thousands on the plains around Klein’s Camp. Having calved down south, they pass through Klein’s en-route to the northern grasslands of the Masai Mara in Kenya.  Malaria: Camps are situated in malaria and tsetse areas; necessary precautions should be taken; tents are fully netted and insect proof.  Camp closure: Serengeti Under Canvas is open all year, even during the rainy season.